Today’s whole world is being automatic. Atomization is taking place in every field like industry automiazation, dairy atomization etc.Then why not college? So we decided to be a part of college atomization & we are working on Automatic”Class Attendance Using RFID” .This concept is already being used in foreign countries. Our traditional method of attendance takes more time, this manual work may create some mistake while marking or giving attendance. Then this attendance is fed to the computer for updating & percent calculation of attendance is done. Reporting of this attendance is done by sending letter to parents. This whole process is very time consuming. So we decided to design a system which can reduce this time & high accuracy to great extent. This idea is about automatic attendance of student in lecture hall which consist of recording attendance, calculating percentage attendance which helps in allocation of term work, & reporting to respective parents. We have used this website for referring microcontroller and MAX 232 datasheets. Also we used this website for overview study of the serial to USB convertor IC FT232BL. 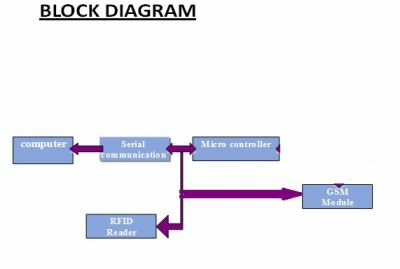 From this website we studied RFID details.Here we have studied RFID tags, working of RFID,types of RFID and advantages of RFID. These two sites we have used for study of GSM module.First site is used for manual study and second site is used for study of AT commands. Our system will start working after entry of username and password of respective teacher. Then another window will appear. When student scans their identity card by RFID reader. I-card is provided with unique code. RFID scans the identifying code from student’s I-card, and then their attendance gets marked. RFID sends the identifying information to PC. Today, there have been 19 visitors (73 hits) on this page!